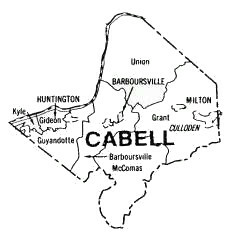 Cabell County tax maps are provided by the Cabell County Assessor to allow easy access and a visual display of county information. Every reasonable effort has been made to ensure the accuracy of the maps and data provided; nevertheless, some information may not be accurate. The Cabell County Assessor assumes no responsibility arising from the use of this information. THE MAPS AND ASSOCIATED DATA ARE PROVIDED WITHOUT WARRANTY OF ANY KIND, either expressed or implied, including but not limited to, the implied warranties of merchantability and fitness for a particular purpose. These maps are for assessment use only and DO NOT represent a survey. These maps are compiled from official records, including surveys and deeds, but only contain the information required for assessment. Resale of this information is strictly prohibited.